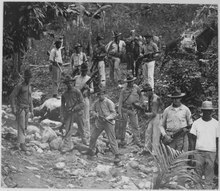 The United States landed in Haiti to restore order on 28 July 1915, and maintained a force of marines to occupy the island until 1934. While US forces were able to pacify the cities quite quickly, the Cacos maintained a rebellion in the mountainous areas to the north. Despite lack of local support, near Cap-Haïtien the Cacos threatened to defeat the US Marines at the Battle of Fort Dipitie, but skilful use of reinforcements enabled the Marines to launch a surprise counter attack that resulted in the entire Caco force being either killed or taken prisoner. The marines then slowly advanced upon the mountainous Cacos territory, eventually trapping and defeating the remnants of the guerilla force at the Battle of Fort Rivière. Charlemagne Péralte emerged as one of the Cacos leaders from his escape from captivity until his death on 1 November 1919. Benoît Batraville, a lieutenant of Péralte, took over as commander of the Cacos in December 1919. He was killed by the US Marines on 20 May 1920. ^ Tierney, Jr., John. "America's "Black Vietnam": Haiti's Cacos vs. The Marine Corps, 1915-22". www.iwp.edu. The Institute of World Politics. Retrieved 19 October 2017. ^ Horace Pauleus Sannon (1938). Histoire de Toussaint-Louverture. Port au Prince: Aug. A. Heraux. Retrieved 19 October 2017. ^ "Haïti– Identité : Manifestation à Savanette pour la réforme de l'Etat civil national". www.alterpresse.org. AlterPresse. Retrieved 20 October 2017. This page was last edited on 20 April 2019, at 01:24 (UTC).